The October, 1993, gathering of many of the world's leading AI and brain researchers, science journalists, philosophers and others in Cambridge, Mass., to celebrate the ongoing life and works of Marvin Minsky was an intellectual and social delight from start to finish, but one of the high points for all there was Arthur's telepresence. He looked great, all smiles and good wishes, and it was a pleasure to pose one of the day's first questions. "Hello, Keith, and let me begin by saying thanks so much for rejecting my latest article!" 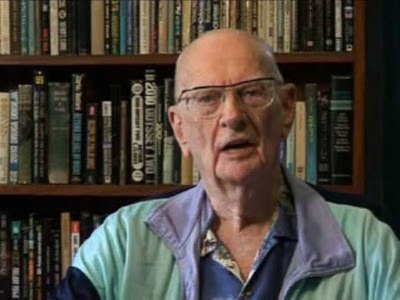 I was at first chagrined, but realized as the day passed that Arthur's comment brought me a certain cachet -- "You really rejected an Arthur C. Clarke article?" "Not up to our standards," I said, making sure my eyes were twinkling as I did so. When I dropped Arthur a note relaying the fun I'd had his expense, he responded with a lovely funny note of his own, along the lines of how he was eager to help me get a good laugh. But the best laugh I ever got from this man who laughed so deeply and well, came a few years later, after his investiture by the Queen. Now that he was Sir Arthur, I wrote him, he could view his various wheelchairs and other devices as support mechanisms existing... Against The Fall Of Knight. He wrote back immediately, certain that I could have heard his laughter all the way from Sri Lanka. I have no doubt that I had indeed heard it -- and I hear that laughter now, and think of the joy and insight, the vision and inspiration, the provocation and speculation, the smiles and, yes, the groans at the puns he loved, the treasure shelves of fiction and the nonfiction. Arthur brought all of this and more to so many millions of readers over the course of one of the great careers in the world of ideas. And even better, one of the great joyous lives in the world of humans.